Anthony Smith Surprisingly Submitted Volkan Oezdemir At The End Of The Third Round! We are live from Moncton Events Centre in New Brunswick, Canada. 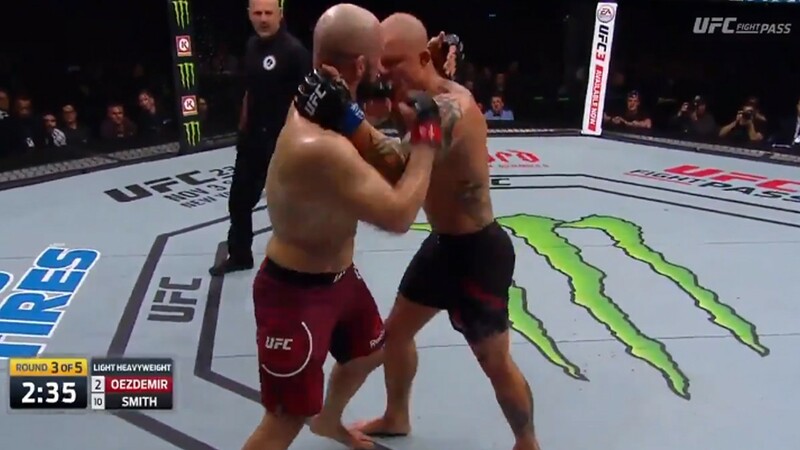 Volkan Oezdemir fights Anthony Smith at the main event of UFC Moncton. This is the showdown of knockout artists. Anthony Smith comes after spectacular elbow KO over Mauricio Shogun Rua. Volkan Oezdemir lost his last match versus Daniel Cormier. It is hard to expect this fight will go to the decision! Fighters shake hands. Both fighters hold their hands high. Good low kick Volkan. Smith tries to take Oezdemir down and pushes him against the cage, but Oezdemir defends and rotates him. Good knees from both fighters, Volkan goes to his left leg with the knee off the clinch and controls the position, he has the left hand under. The fighters separate. Left low kick Smith. Volkan with a good left hand. What a combo by Oezdemir, Smith survives. Smith with a good right hand. Front kick to the head missed by Smith. Left hook miss Oezdemir. Left low kick Smith, right low kick Oezdemir followed by a right hand. Again low kick Smith. Right low kick Volkan. Good left hook and escape by Smith. Volkan misses a punch again. Great overhand right Smith, but Volkan returns with a combo. An eye gauge by Smith! Oezdemir recovers. Smith gets a warning! What a body kick by Oezdemir and a good high kick but Smith returns with a right hand and survives. Good jab Volkan. Good elbow by Smith Oezdemir returns the strike. Low kicks Volkan, two in a row, and he pushes Anthony to the cage, controlling the position. The end of the round, very hard for scoring! Oezdemir with a low kick, and amazing right punch by Smith. Oezdemir moves great. Left low kick Oezdemir and again two in a row!What a counter combo by Smith, he has the pace now. Oezdemir tries a right low kick but eats a counter punch. Oezdemir takes Smith down, what a counter! Oezdemir in a half guard. Volkan tries to mount his opponent, but Smith defends, and now goes for a heel hook, but Oezdemir defends, he has the back now. Great right hands! Oezdemir pushes the hand under Smith’s chin but no success. Volkan continues raining punches. A knee to the body. Oezdemir tries to rotate the opponent but Smith doesn’t let him. Smith defends rear-naked choke attempt well, great right uppercut by Volkan. And an elbow. A knee to the body. Good hammer fists from Oezdemir. Volkan holds the opponents back and the round is over. The round for Volkan Oezdemir! Front kick to the body Oezdemir. Low kick Oezdemir, right straight Smith. Left hook missed by Oezdemir again. Great left hook counter by “Lionheart”. Again left hook and combo by Smith, excellent right hook to, Oezdemir defends. Right straight by the Swiss legend. Body kick Smith. Knee to the body Smith, but great uppercut Oezdemir. Low kick Oezdemir went down but stood up again. Fighters trading shots, so many good punches. Smith connected three punches to the head! Oezdemir counters with two punches, what a match! What a right hand by Smith, Volkan makes two steps backward! Smith takes the opponent down! Smith takes his back, this is trouble! Oezdemir bleeds, and right hand is under Volkan’s neck. Will he defend? This is a very dangerous rear-naked choke, the arm is tight under the chin. But the referee doesn’t stop yet, Oezdemir slips. But Smith adjusts and the referee stops the fight, Oezdemir taps out! Volkan Oezdemir drops to 15-3 MMA, 3-2 UFC, while Anthony Smith improves his score to 31-13 MMA, 6-2 UFC. Awesome submission victory for Smith!